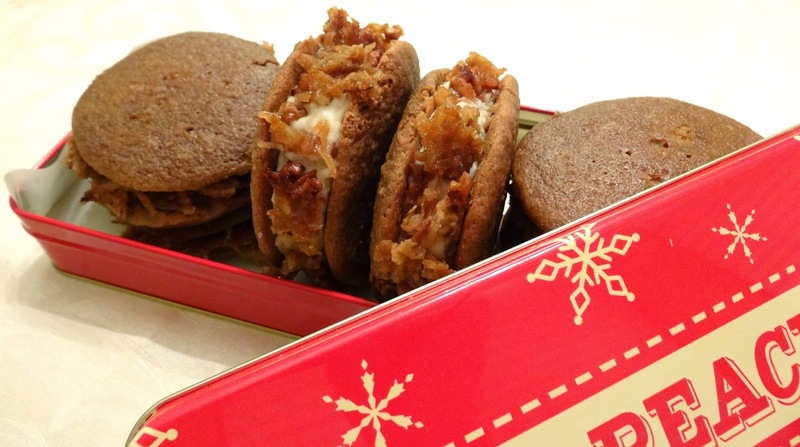 Be sure to check out the rest of the recipes from this year's 12 Days of Cookies. Well, another year, and another 12 cookie recipes have come and gone. I can't believe December is almost over! It's been a crazy year, and I can't wait to see what comes with the new one. I've had so much fun doing the 12 Days of Cookies again this year, and I'll definitely be doing it again next year. This time around, we finished just in time for Christmas Eve. Will Santa be enjoying some of these cookies at your house tomorrow night? He sure will be at ours! When I was thinking about recipes for this year's 12 Days of Cookies, I was reading a book that kept talking about a German Chocolate Cake and I decided that some kind of German Chocolate cookie would definitely have to be on the list. After a little contemplation, I dreamed up these cookies. And boy, am I glad I decided to make them! Contrary to what seems to be popular belief, German Chocolate, and the cake made from it, are not German in origin. Way back in the 1850's a man named Sam German created a mild dark chocolate bar for the Baker's chocolate company. They named the chocolate in his honor: German's Chocolate. As a culture, we have fallen in love with the chocolate, and everything made from it, but forgotten about the 's, thus creating some confusion about the chocolate's origin. One thing that isn't confusing is how delicious these cookies are. I loosely based my cookie recipe on a German Chocolate Cake recipe that came from my friend Jessica's Grandma. The filling is a cream cheese frosting base, with toasted coconut and pecan. Then, the cookies are rolled in a coconut pecan brittle that tastes just like the gooey topping traditionally on a German Chocolate Cake. Have a very Merry Christmas, and a Happy Holiday Season! Preheat oven to 350 degrees F. In a small, heat-proof bowl, stir together the chocolate and boiling water, until dissolved. Set aside. In a large mixing bowl, cream the butter and sugar until light and fluffy. Add the egg yolks one at a time, beating well after each addition. Mix in the vanilla and melted chocolate. Sift together the flour, salt, baking soda, and baking powder. Set aside. In another bowl, combine the milk and vinegar. Add the flour mixture to the chocolate mixture, alternating with the milk mixture. Beat until smooth. In a glass or metal bowl, beat egg whites to stiff peaks. Fold into batter. Drop batter by tablespoonfuls on a parchment lined baking sheet, 2-3 inches apart. These cookies will spread! Bake for 8 - 10 minutes. Allow to cool 5 minutes on baking sheet before removing to a wire rack to cool completely. Once cooled, pipe equal amounts of the Coconut Pecan Filling onto the bottom of half of the cookies. Top with the other half of the cookies, sandwiching the filling between the bottoms of both cookies. Roll the edges in the brittle to coat the exposed side of the filling. Store in an airtight container, with parchment or waxed paper between each layer. Makes about 24 sandwich cookies. In a large mixing bowl, cream together the butter and cream cheese. Add in the vanilla. With the mixer on low speed, mix in the powdered sugar. Stir in the coconut and pecans. Mix all ingredients together and spread out on a parchment lined baking sheet. Broil, with the oven rack on the second setting, about 5 minutes, or until brittle is bubbly and starting to brown. Allow to cool. Break into small pieces. If brittle is still too soft/gooey to break, put back under the broiler for another minute or two.